Fly Fish in Cherokee North Carolina with Fly Fishing the Smokies. The Smoky Mountain’s Best Outfitter and Guide Service! Trips daily out of Cherokee, and Bryson City North Carolina. We offer Fly Fishing Lessons, Tours, Guides and Trips in Cherokee, fishing the Cherokee Trophy Fly Fishing Only Section, the Great Smoky Mountains National Park, WNC Fly Fishing Trail, Tuckasegee River and Little Tennessee River. Since 1999 we have guided anglers of all ages and skill levels to some of the most beautiful Trout Streams in all of North Carolina and Tennessee. Learn to Fly Fish with the Best Guides in the Smoky Mountains. We offer private all inclusive Wade Trips, Drift Boat Trips, Beginner Classes and instruction. Your choice of Half Day or Full Day Trips. We also offer Hazel Creek Back Country Camping in the Great Smoky Mountains National Park. Fly Fishing the Smokies has something for everyone and for every budget. We provide a great day of guided fishing and instruction, along with all necessary gear and equipment, without the price gouge. Be sure to check out our Fall Specials! 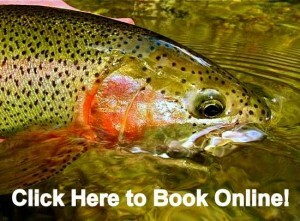 Fish with the most experienced guides in the Smokies. The Absolute Best Deals in the mountains! Fly Fishing the Smokies is a registered trademark name of Fly Fishing the Smokies Inc.